Born in Spokane on May 25, 1918 architect Lawrence George Evanoff attended local schools, graduating from Lewis & Clark High School in 1936. With no formal training, somehow Evanoff ended up in Detroit, Michigan working for the noted architectural firm of Smith, Hinchman & Grylis (1940). Reports indicate that he served as a designer for the firm for at least a year. By 1941, Evanoff had relocated back to the Pacific Northwest and took a job as a site planner for the Narramore, Bain, Brady & Johanson firm in Seattle. He then migrated back to Spokane and took a job as a site planner for the architectural firm of Whitehouse & Price (1942), before becoming the chief draftsman for G.A. Pehrson (1943). After being drafted, Evanoff rose to the level of Sargent in the U.S. Air Force. During WWII he served in the South Pacific with the infantry and field artillery, and became a photographic technician during the later part of his enlistment which took him to the Philippines and Japan. After the war, Evanoff decided to go to back school, and like many returning GI’s he took advantage of stipends, which covered tuition and expenses for veterans attending college under the Servicemen’s Readjustment Act. 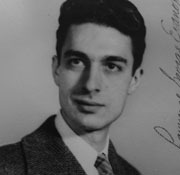 He enrolled in the architecture program at the University of Washington and graduated with a Bachelor’s degree in 1948 at the age of 30. Upon graduation Evanoff was hired by the University of Idaho to take over the classes of retiring architect, T.J. Prichard (1948-49). He and fellow architect, Royal McClure taught all the architectural courses at the university for a year. For reasons unknown Evanoff left the University after a year and decided to open his own firm in Spokane in 1949. Like many architects of his day, Evanoff was an enthusiastic proponent of the “modern” style, believing that architecture “should restrain from copying the classical forms and instead design structures that were suitable for todays present-day needs.” He advocated his position heavily during the 1950s and 60s, through a series of newspaper articles and community lectures. In those he touted the benefits of flat roofs, called for an elimination of front porches, supported carports rather than garages, frowned on the use of picture windows fronting the street, and called dinning rooms “dust catchers”. Such ideals garnered him an entrée into the nationwide architectural scene where he provided several designs for the noted west coast architectural publication: Arts & Architecture. His first design proposal was for a strict modernist home for a newly married couple. Featured in the February 1949 issue, the house was reflective of Mies van der Rohe’s 1929 Barcelona pavilion and boasted limited planer exterior walls juxtaposed with glass window slabs and a bold stone anchor wall; all of which supported a continuous planer flat roof. A similar design was featured in the summer 1950 issue of the magazine. Evanoff also won a $1,000 prize for designing a model kitchen for the National Association of Homebuilders (1951). However it was his design for a home for Robert Arick which garnered him the most attention. After being featured in May 1953 issue of Better Homes & Gardens (which publishing 11 photos of the home, five in color), his B H & G plan #2305 was picked up by the Associated Press in 1954-55 and the design was featured in a variety of newspapers across the county from Huron, SD, to Corpus Christi, Texas, to Eugene, Oregon. Other notable early projects included another home for Better Homes & Gardens Five Star Homes (plan #2712, December 19570; a remodel of Dr. George E. Wood House; and a remodel of the Robert F. Goldsworthy House (1955) near Rosalia which turned a typical rural farmhouse into a modern dwelling. Other important early projects include the Aero Liner Manufacturing Plant (1950) in Spokane; a 2-room schoolhouse in Heron, Montana (1954); the Panhandle State Bank (1954) in Coeur d’ Alene; the Thaler Medical Clinic (1955); the Manito Methodist Church Parsonage (1956); a Seed House for WSU (1958); Sacajawea Jr. High School (1959, with Whitehouse, Price, DeNeff & Deeble); and Shaw Jr. High School (1960, with Whitehouse, Price & DeNeff ). With an increasing clientele, in 1959 Evanoff formed a partnership with Nicholas Kabush. Together they designed a variety of buildings scattered across the Inland Northwest including the E & K - Professional Building (1960); E & K Apartment House at 7th & Division (1961); the WSU Publications Building (1963); and the Smith Agricultural Engineering Laboratory for WSU (1968). Respected by his peers, Evanoff was also heavily involved in the Spokane chapter of the AIA serving as chapter secretary (1953), Treasurer (1954-55), President (1955-56), and then Trustee (1956-59). In 1971 Evanoff was forced to retire after battling multiple sclerosis for a number of years. He died in Spokane on January 24, 1985 at the age of 66. “A Beauty for a Narrow Lot!” – Better Homes & Gardens – December 1957. “Farm House Gets New Look” – The Spokesman Review, October 23, 1955. “Government Building Order to mean Shelving of Plans” – Spokane Daily Chronicle, January 17, 1951. “Home in Spokane Magazine Feature” – Spokane Daily Chronicle, April 22, 1953. “News in Brief – Spokane Construction Council…” – Spokane Daily Chronicle, October 11, 1955. “Formal Ball Is Set To Mark Centennial” – Spokane Daily Chronicle, February 13, 1957. “Obituary: Lawrence G.K. Evanoff” – Spokane Chronicle, January 28, 1985. “House Design is Adapted To Times” – Spokane Daily Chronicle, September 12, 1951. “Industry Wants Attractive Plants” – Spokane Daily Chronicle, March 22, 1950. “Architects Slam Proposal for Standard School Plan” – Spokane Daily Chronicle, January 28, 1957. “Architect’s Offices Opened by Veteran” – Spokane Daily Chronicle, November 22, 1949. “School Takes Form” – Spokane Daily Chronicle, August 20, 1959. “A Transitional Home for the Early Years: Lawrence Evanoff, Architect” – Arts & Architecture, Feb 1949. pg. 32-33. “House by Lawrence Evanoff, Architect” – Arts & Architecture, Feb 1949. pg. 32-33. “Modernistic House Shown in Magazine” – Spokane Daily Chronicle, April 19, 1950. “Kitchen Design Wins Top Prize ” – Spokane Daily Chronicle, January 31, 1951. “Picture Display Show Buildings” – Spokane Daily Chronicle, November 30, 1955. “Group Installs Officer Slate” – Spokesman Review, June 26, 1955. “Plaque Honors Shaw Builders” – Spokesman Review, February 25, 1960. “Shutter Unit To Meet” – Spokesman Review, November 15, 1961. “2-Room School is Dedicated” – Spokesman Review, February 10, 1954. “Clinic Readied” – Spokane Daily Chronicle, July 26, 1955. “Church to Build New Parsonage” – Spokane Daily Chronicle, May 6, 1955. “Four Architectural Firms Allocated School Projects” – Spokesman Review, December 27, 1956. “School Board Delays South Side Hearing” – Spokane Daily Chronicle, March 13, 1958. “Social Event Planned” – Spokane Daily Chronicle, August 22, 1952. “School Land Use Battle Goes On” – Spokane Daily Chronicle, October 9, 1958. “New Apartment Under Construction on South Side” – Spokesman Review, November 5, 1961. “Wives Invited to a Party” – Spokesman Review, November 24, 1953. “State Cash Possible for New Junior High” – Spokane Daily Chronicle, January 2, 1958.